First off, let me begin by sharing my sincere apologies for essentially dropping off the radar for the past 2 weeks. The last 2 weeks were a true whirlwind but, what is important, is that I am back now. So, let’s get right to it. 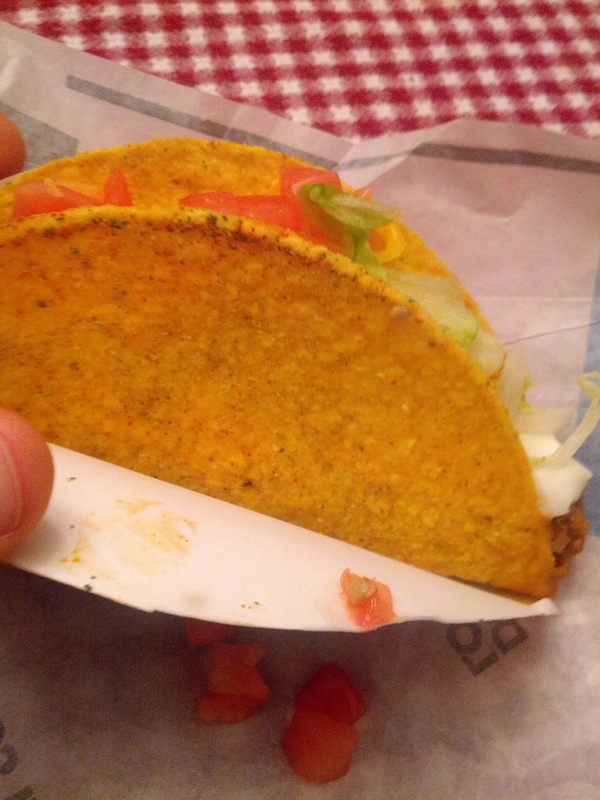 The Doritos Locos Cool Ranch Taco at Taco Bell came out months and months ago. I had been pending the trying of it but, I was finally able to do so tonight. Per a tradition that we began back in 2005, dinner for the first night of camp is Always Taco Bell. No, I may not be working at the Park anymore but, luckily Taylor is and the tradition remains. Tonight was the night to decide if the Myth was Reality. I ordered myself one Doriots Locos Cools Ranch Supreme Taco. I must say, it is a complete mouthful placing the order. I felt like I just kept saying the name and saying the name but never getting anywhere. My items were delivered to my car and I drove them home. I unwrapped the taco to find one side of the wrapper to be Nacho Cheese and one side to be Cool Ranch. I did not keep the taco in the wrapping – far too difficult to eat – but, rather removed it. I found the shell to be a little lighter in color than the traditional and, of course, full of those tasty Cool Ranch flakes. I got some on my fingers and tried them…just to confirm they were correct…and indeed they were. My first bite of the taco, was nothing amazing. And neither was the second or third. I would have never guessed that the shell was Cool Ranch. The only time I could tell the difference in taste, is when I ate some of the Cool Ranch flakes. Otherwise, this was a basic Hard Taco Supreme. The soy-processed-partial meat was delicious and mixed with the melty cheese, cool sour cream, lettuce and tomato, made for one delectable taco. I loved the taco from start to finish but, again, this was nothing more than a Hard Taco Supreme. When the Cool Ranch flakes mixed in, I said ohh cool…but did not feel as if they changed the flavor of the taco at all. After a few quick bites, I had completed the taco and still could not really taste the Cool Ranch. The concept of this Taco is far greater than the actual product. Seeing as how this taco is more expensive than a normal Taco, I would have expected more. Yes, it was delicious but, it was no different than the thousands of Hard Taco Supremes I have eaten over the years. I found the Cool Ranch flavor to be so beyond the back seat, that it was hanging on trying to be noticed. 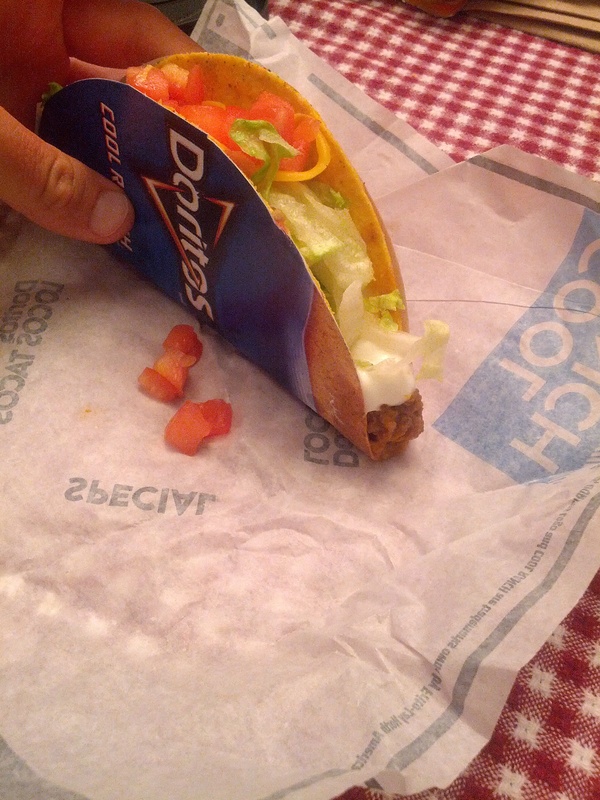 The Doritos Locos Cool Ranch Taco is a great idea but, in the end, this is simply a Myth. I can now confirm that the Myth was not Reality.